FarmgirlCyn: Does THIS make me a "redneck woman"? Does THIS make me a "redneck woman"? So what if I drink my tea from a mason jar! And when I am working in the gardens, I don't want to have to go running in and out of the kitchen for a drink. So I make me up a quart of instant decaffeinated tea, throw in some ice and a chunk of lemon, and out the door we go! How do you like my Goodwill find? The pot was $1.00, and the rosemary was one sprig for $1.39. Why, I'd need all three sprigs for a pan of rosemary roasted potatoes! Geez....I'm gonna need a whole lot more rosemary, aren't I? The rosemary is calling me to come back. so I'm going with my $7.99 for a 4" pot. I love your goodwill find! I am planning on planting a bunch of rosemary next year because I just read that they will help deter deer. we'll see... lol. Now, you've got me craving iced tea. See ya! Sweet tea in a mason jar just plain tastes better! Two more things ... I also love the blue pot... my daughter, Amanda would LOVE the color! You have a BUNN coffee pot! That makes great coffee! We have one at school... delish! do you keep your white lights on year round, too? 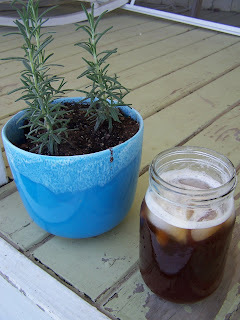 I loved that pic of the rosemary and the mason jar of tea..hmm maybe that makes me a 'redneck' too! The big 2 qt jars are great for brewing a whole batch of sun tea. I love that they sell one-piece plastic screw on lids for canning jars now. Not crazy about plastic, but they make using the jars for storage and drinking a lot easier. Mmm...that tea looks mighty yummy! And I love it in a mason jar =) Yeah, "fresh" herbs are so very costly, I really need to start growing my own! Tea in a mason jar isn't redneck, it's farm girl chic :). Anybody can drink from a regular glass! Definitely my kind of woman! I've been known to do that! There used to be a restaurant chain in the Southern US called "Po folks" who had mismatched cutlery and served drinks in mason jars! Drinking out of mason jars is completely normal. But maybe we're both rednecks? Love rosemary because, it smells so good and really pretty. Love drinking out of jars! They make the best glasses! Don't worry your Rosemary should grow into nice little bushes, but it is a slow grower! Nope! I wouldn't call you a redneck! But honestly, when you are outside working away from the house and it's hot and a long walk, AND there are bugs just wanting to climb in and swim all day long, a mason jar with a lid makes a lot of sense. I love drinking out of mason jars!